This past weekend I took some time away from the computer. After a month of pushing to get a book written and edited, it was a nice break. We did some Christmas shopping, visiting and errands. While I was out, I couldn't resist browsing in the book section. And that's where I picked up this week's read. It's a Christmas romance. I just love them. I've started reading it and it's as wonderful as I expected. Ami has a great voice and wonderful characters that draw you into the story. I hope you enjoy it as much as I am. 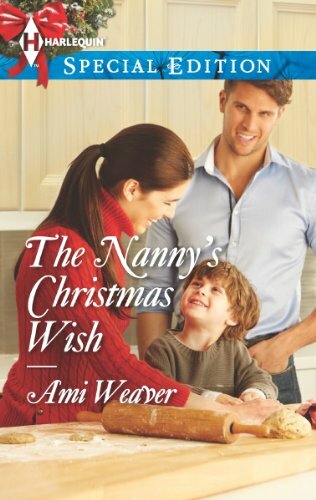 In her debut novel for Harlequin Special Edition, Ami Weaver gives a lonely single dad and his sweet son the perfect holiday gift—a nanny with a secret who just might heal their family in time for Christmas! Josh Tanner and Maggie Thelan share one unbreakable rule: no romantic entanglements. Period. So the lonely doctor hiring the former teacher as a live-in nanny for his little boy shouldn't be any kind of threat to their creed. Especially since Josh won't let go of the past—and Maggie can't tell Josh who she really is…. But rules are made to be broken, and while Maggie only wants to know the nephew she never knew she had, deeper feelings keep getting in the way! As the holiday season creeps closer, his rules collide with her secret. Can their unexpected love survive the truth?